The 2018 FIFA World Cup was be the 21st FIFA World Cup, the final part of which was held in Russia from June 14 to July 15, 2018. Russia for the first time in its history became the host country of the world football championship. In addition, for the first time it was held in Eastern Europe. Also for the first time the mundial took place in the territory of two parts of the world - Europe and Asia. 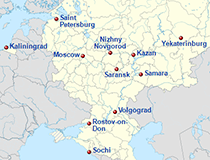 The championship was scheduled for 12 stadiums in 11 cities of Russia. For the first time in the history of the FIFA World Cups, the video assistant referee was used. 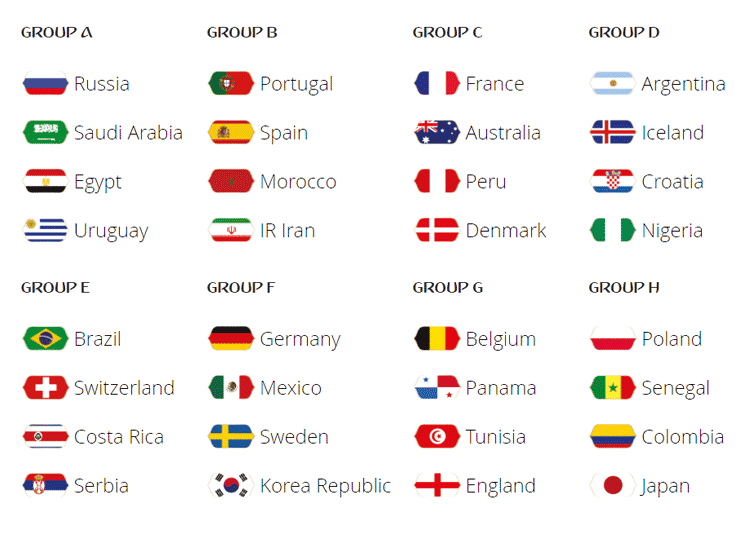 32 teams took part in the final tournament of the World Cup in 2018. In the final of the World Cup, France beat Croatia (4:2) and became the world champion. The national team of Russia reached the stage of quarter-finals - the best result in its post-Soviet history. The total attendance of the World Cup was 3,031,768 people, the average attendance - 47,371 people per game. During the World Cup in Russia (64 matches), several records were set - the highest number of penalties - 29, own goals - 12, only 1 match ended without goals scored. In total, 169 goals were scored, 2.64 goals per game. The most scoring team of the World Cup was the national team of Belgium - 16 goals in 7 games. The main referees watched the replays provided by VAR 20 times and 17 initial decisions were changed. 3 July, 2018 / National House of the Fans of Mexico in Moscow. 5 June, 2018 / Commemorative Coins of the World Cup 2018 in Russia. 1 December, 2017 / Final Draw of the FIFA World Cup 2018 in Russia. 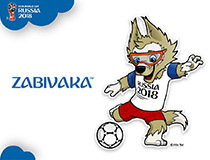 In the logo of the 2018 World Cup you can see the silhouette of the FIFA World Cup. Exploration of space, iconography and love of football are the three components of the logo. 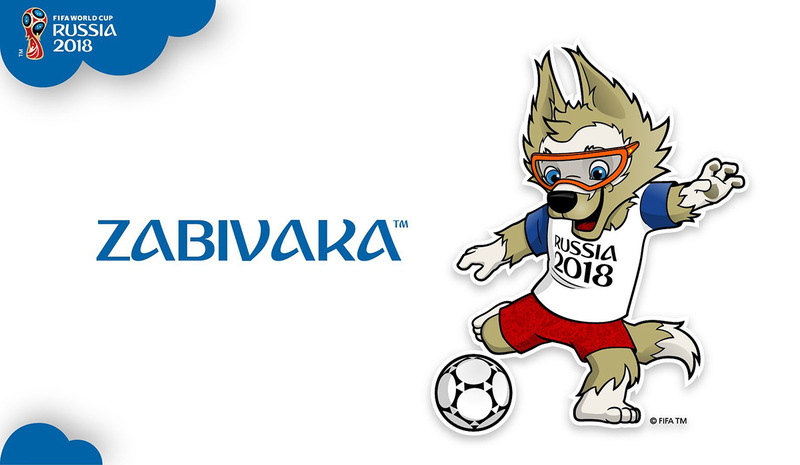 The official mascot of the World Cup in Russia was the wolf named Zabivaka meaning “the one who scores a goal”. Yekaterinburg - Yekaterinburg Arena (35,000). The opening match and the final were held at Luzhniki Stadium in Moscow. 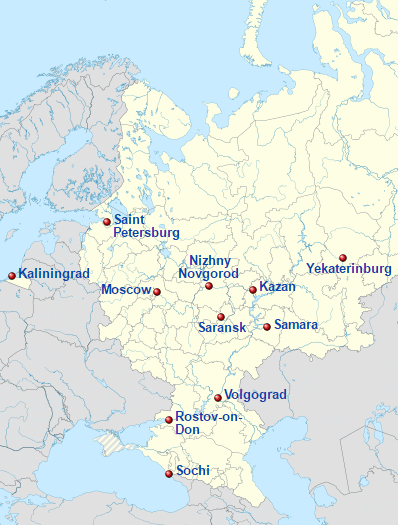 One of the semifinal matches was played in St. Petersburg, the other one - in Moscow.